We encountered a problem which seemed really strange while provisioning our site collection with PowerShell (New-SPSite). Our provisioning contains programmatic custom list creation to our publishing webs via feature receivers. The procedure is that the feature receiver creates the list with a URL friendly Title and then changes the Title to a UI friendly version. Say, a list “orderform” is created and then the name of the list is changed to “Order Form” would result that we have a list “Order Form” at URL http://sharepointsite/lists/orderform. What would you say if I told you that you can’t change the Title of a list after it is created with PowerShell or custom console app, if you are working with sites any other language than English. Well it’s true. I’ve tested it with two Team Sites, one in English and another in Swedish and by creating a generic list “Temp” to both of them. 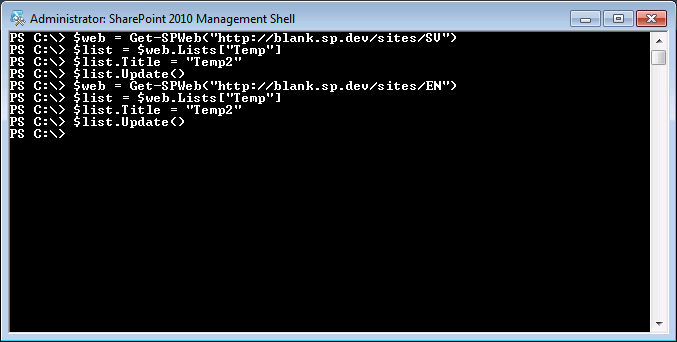 Then I tried the following PowerShell commands on both of the sites. …while the English site’s list title is updated as expected. Some properties ARE NOT updated if the Thread’s UI Culture IS NOT the same as the web’s UI Culture. 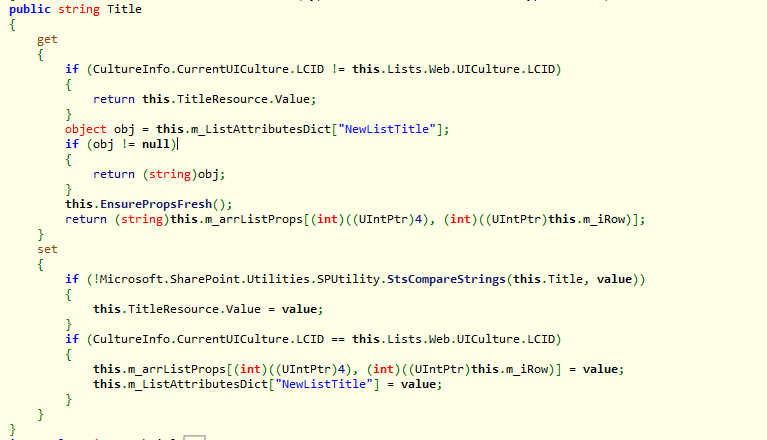 This is actually documented on MSDN (http://msdn.microsoft.com/en-us/library/microsoft.sharepoint.splist.title.aspx). TitleResource being the key word. Here is a solution for changing Thread’s UI culture in PowerShell: http://blog.andersdissing.com/2011/07/change-powershell-ui-culture.html. Thank you soooo much Juha! This fixed everything, even my missing field descriptions, which was unexpected! Thank you soooo much for this. I don’t know what they were thinking when adding this validation. I don’t know how many days I’ve spent cursing over inconsistencies in how sharepoint deals with titles/displayname for fields and lists. The behavior I encountered made no sense, but having read this thread I’ll have to go through it again and see if I can make sense of it. get that type of info in such a perfect way of writing? I have a presentation next week, and I’m at the search for such information.